Whenever a restaurant is perched up high on a mountainside or right near the water, it instantly becomes popular for its location alone. Sometimes, the food is almost an afterthought. If you think about it, the trend now is to "decorate" restaurants with such attractive staff and ambiance, we forget that we're actually there for the food. That would be true for places like Cactus Club, Moxies, Joey and Earl's. To be fair. some of the food at the aforementioned places are actually good (albeit expensive). Now, getting back to the restaurants with a view... 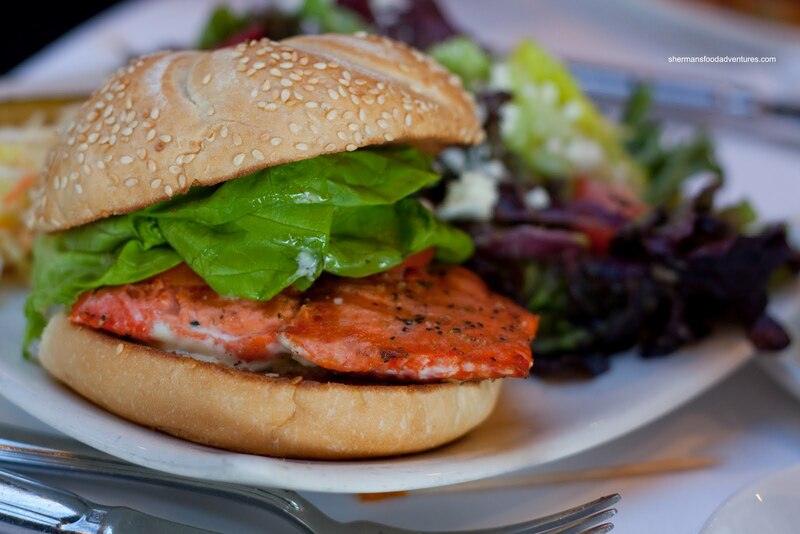 There are many to choose from in the GVRD: Salmon House on th e Hill, Fraiche, Horizons, Aqua Riva, 5 Sails, Cloud 9, Monk McQueens, Bridges, Stonegrill, Provence Marinaside, Cardero's, The Teahouse and Seasons in the Park to name a few. For those who are familiar with these restaurants, some of them do not necessarily serve "great" food. Rather, it would be "alright" food with a view. 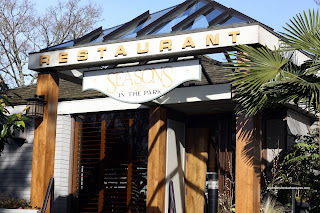 We've been to Seasons in the Park on several occasions in the past with varying degrees of impressiveness. Seeing how we've never had brunch there before, we bundled up the family on a Sunday. As if Irish eyes were smiling down on us, the sun was out and it couldn't have been a better day to be at the park. Well, maybe a warmer day that is. So, we started by sharing the Crab Cake & Risotto. You know how some crab cakes seem like more filler than anything? Not so with this one. Loaded with sweet, fluffy crab and a crisp exterior, this was a well-executed dish. The risotto was an afterthought since we didn't even notice it to tell you the truth. It could've been just very soft as well. 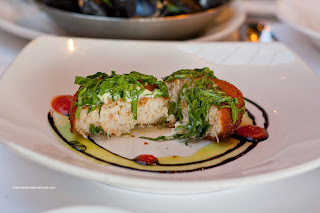 The arugula on top and the olive olive with balsamic reduction very understated which let the crab shine. For our second appy, we went for the standard Mussels and Frites. 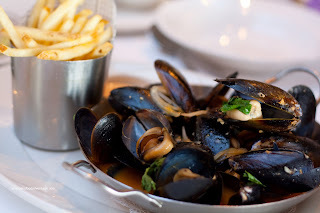 Bathed in a coconut curry broth, these mussels were pretty good. Each one was open and plump while the broth was very fragrant. The accompanying fries were crisp and came with a garlicky aioli. 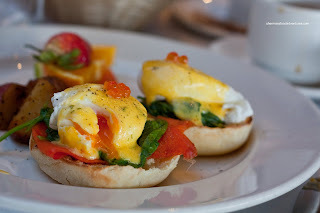 For myself, I had the typical West Coast thing in the Smoked Salmon Benedict. With perfectly poached free-range eggs and a lemony Hollandaise, this was another solid offering. Love the ikura on top, it looked pretty. Everything went well with each other from the just-enough light Hollandaise to the crisp English muffin to the slightly wilted spinach. 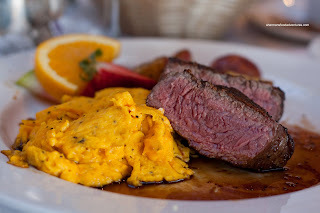 Surprisingly, my mom went for the heaviest dish in the Steak & Eggs. The steak was cooked a perfect medium-rare as evidenced in the picture. It was sufficiently tender as well with a nice meaty flavour. The Cabernet demi-glace had a rich red wine flavour which naturally compliments the meat. As for the scrambled eggs, they were slightly past fluffy; yet were still quite good. 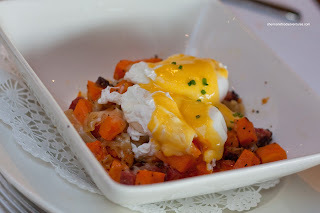 Viv ended up with the Corned Beef and Sweet Potato Hash. A combination of cubed corned beef, sweet potatoes, onions and Swiss Cheese, this was something different. Personally, I'm not convinced with the use of sweet potatoes since the hash becomes quite heavy and overly sugary (especially with the onions). However, it was good in its own ways, particularly contrasting the savoury corned beef. The entire thing was topped with 2 perfectly poached free-range eggs and Hollandaise. Viv could only eat less than half of this since it was so filling. For the kiddies, we got them the French Toast, which the restaurant nicely split up for them. 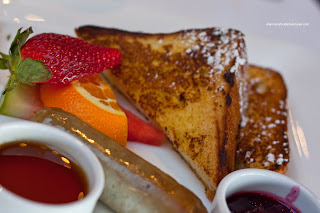 The brioche French toast came with banger sausages and fruit compote. The kids, like me, are suckers for brioche since it is soft and sweet to begin with. Add more egg to it and it is almost melt-in-your mouth requiring little chewing. The French toast was solid; however the star of the whole thing were the wonderful sausages. They were meaty while not fatty with a pleasing texture. Lastly, my dad had the BC Salmon Burger with rémoulade, coleslaw and salad. A fairly simple item which basically depends on the correct execution of the salmon. In this case, the salmon was overdone and dry. Not terrible by any stretch of the imagination; however, it is not the way I like my salmon done. The salmon burger withstanding, our brunch at Seasons was pleasant and generally very good. We found the prices to be very reasonable considering the quality of the food and the awesome view. I guess it helped that it was nice and sunny too. The service was okay, with a few lulls in between (they were busy though). So in terms of brunch, the view wasn't the only highlight, the rest of the experience was solid as well.